A pop-rock contemporary christian music album with a theme of the end times! 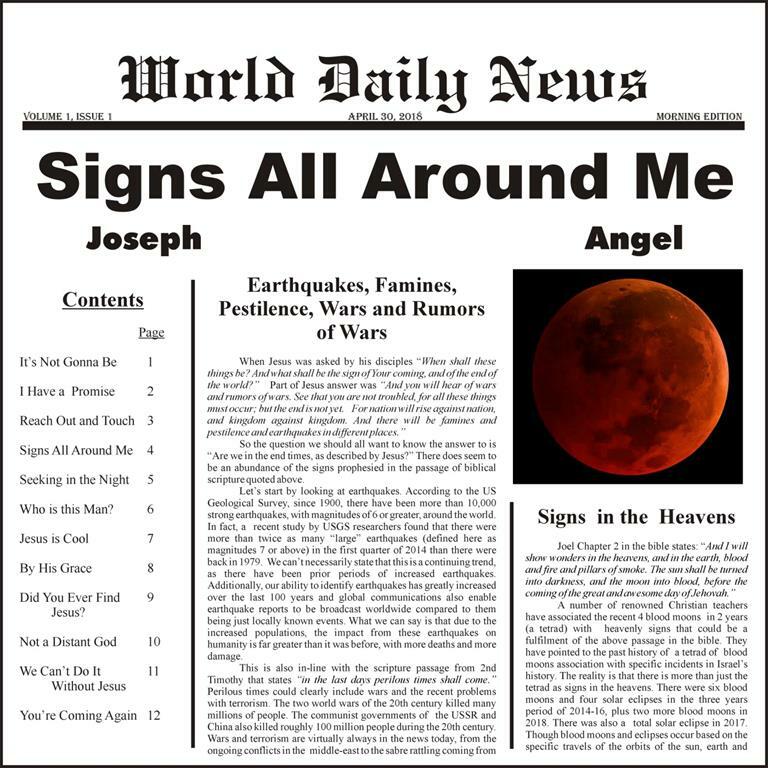 Joseph and Angel are back with our ninth album "Signs All Around Me". The songs on this album are primarily written with a focus on the soon rapture of the church and second coming of our Lord and Savior Jesus Christ. Of course we threw in a few that don't have that direct focus to round out the album. As is typical of most of our albums, there is a lot of variety in the music styles, and strong and uncompromising gospel message in accordance with the Word of God. The first song "It's Not Gonna Be" is somewhat of a medium pop rock with the message that Jesus is coming back and the end of the world is not going to be like the world thinks it is. Angel follows this with "I Have a Promise" to keep up focused that this world is not all we have, there is a promise for a better, heavenly, future. Next up is one of Angel's ballot's "Reach Out and Touch". For the bible fans among you, you will notice the story of the woman with the issue of blood woven into song here. The title song "Signs All Around Me", obviously referring to the signs of the end times, is again a medium rock song done with the band. "Seeking in the Night", a pop-rock song with some unusual, at least for modern music, use of instruments. How often do you hear a harpsichord in rock music? "Who is this Man?" is a ballot by Joseph with the focus on Jesus (of course!). Next up is "Jesus is Cool" a late 50's/early 60's style Rock and Roller that is a lot of fun. Besides, Jesus is cool! Angel follows this with a ballot "By His Grace". For the skeptics out there, next is "Did You Ever Find Jesus?" a rock song with a message directed at the lost and those who are searching (often don't know they are searching) and looking everywhere except to the One who can fill their empty hearts. "Not a Distant God", is in a style that is unique, not quite Creedance Clearwater Revival, but you'll likely hear the influence. Angel challenges you to look up to God, that He is not distant at all, but right there for you. "We Can't Do It Without Jesus" is a band favorite that helps us remember that to change the world, we have to change hearts, and only Jesus can really do that! Finally, the last song "You're Coming Again" is a ballot by Joseph to remind us that Jesus is coming again, in the rapture of the church and the second coming. Did You Ever Find Jesus?